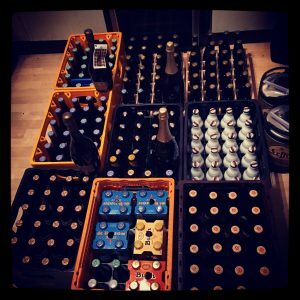 Shopping for beer in Belgium is a dangerous game. Seriously. Without a doubt you’ll get carried away and buy too much – if there is such a thing. I discovered this on a trip to Europe by campervan where we had the luxury of lots of space to bring stuff back. 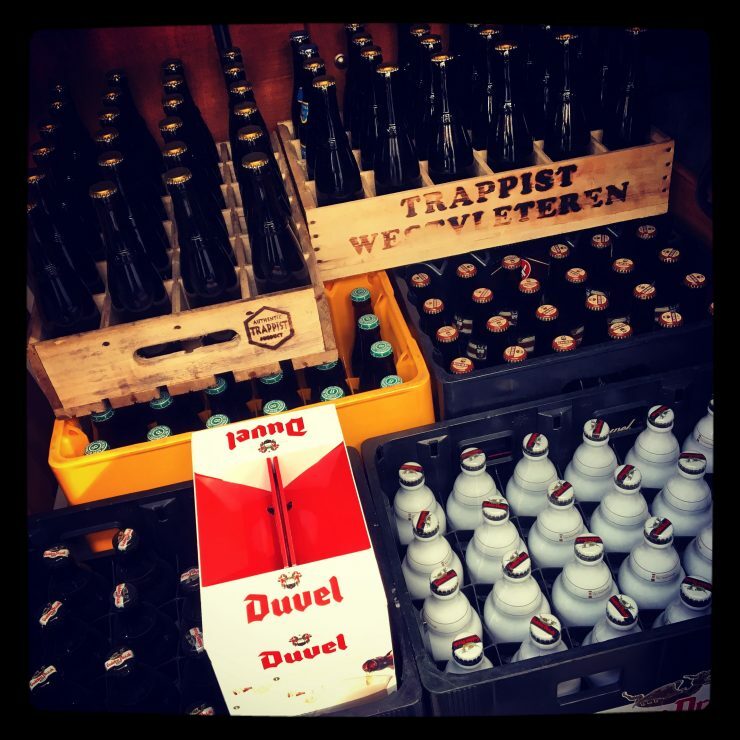 We were camped just outside Bruges and already had the van stocked up with an abundant supply of Westvleteren 12 (two cases!) courtesy of Sint Sixtus Abbey. But we decided we still had room for more and started researching our Belgian beer shopping options. 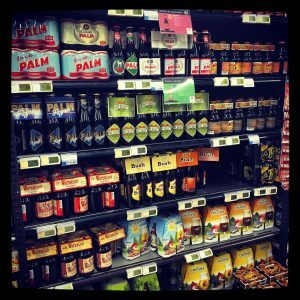 If you’re looking for great prices, and a better selection, than the UK has to offer you really don’t need to look much further than the supermarket in Belgium. We stopped by the local Carrefour supermarket on the outskirts of Bruges and were blown away by the offering. There were aisles upon aisles of beautiful beers to choose from and the prices were incredible. Beers you would pay £5 for in the UK were going for little more than 1 Euro and we were like kids in a sweet shop. I’m pretty sure the cashier could smell the fact we were British a mile off as she beeped through our copious amounts of beer. But still we needed more. We had a few favourites and knew we wanted to take them home by the case-load, so figured we could get even better value going to a wholesaler. I took to Belgian beer forums looking for tips on the best places to buy, and someone pointed me towards a place called Prik & Tik. I popped on to the website and realised it was perfect. Even more so because, by chance, it was a stone’s throw fron where I was staying in Bruges. The boyfriend and I arrived and our eyes were like saucers. I’ve never seen him look so enthusiastic doing the shopping. He armed himself with a trolley and proceeded to wheel about the place, with a huge grin, stocking up. Most of our favourites were readily available. There were even glasses for sale, and although we were no more than ten minutes from the centre of Bruges, these glasses were selling at a fraction of the price they were going for in the city centre. I was sure there must be a catch. I thought we’d hit the till and be told we needed to sign up for a membership or something. But no, I was wrong. We’d parked out back and it was as simple as wheeling our haul from the checkout to the back of the van, and our only worry was where the heck to put all that beer. We stacked the crates up as high as they’d go without toppling. We rolled the 6 litre mini kegs we’d bought in the supermarket inside our duvet to make space. And we threw blankets over the top in case anyone spotted our haul and decided to target the van to steal a beer or ten. Remarkably the suspension in the van didn’t give out and we trundled our way to the ferry with no problem. It was only when we parked up and got ready to set sail that the van attracted some attention. We were asked to get out and the security guys asked us to let them see inside. I wanted to say “I’m not an alcoholic!” but instead I just said, “Of course, take a look” and slid open the back door. I whipped off the blanket concealing the crates and felt a mix of pride and apprehension as the guy eyed our purchases. We were definitely within the limits allowed by customs, I’d checked…but that didn’t stop me doubting myself. He looked past the crates and started prodding the duvet studiously, then looked at me questioningly. “Beer kegs”, I explained, and he understood. Turns out they weren’t checking how much stuff we’d brought back. They were looking for people smuggled in the van. Fat chance of that…we could barely fit the beer let alone any extra people. Finally we made it home and the worst part of the whole shopping experience was getting the stuff up the stairs to our small flat. When we laid it out it took up the majority of the kitchen floor. 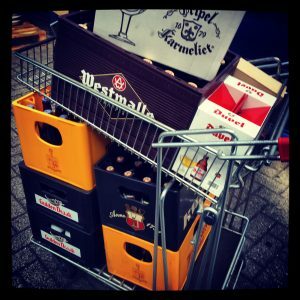 We had two cases of Westvleteren 12; cases of Gulden Draak, Gulden Draak 9000, Kwak, Westmalle Tripel, Rochefort 10, Rochefort 8, a Duvel gift set; some Perfect Draft 6-litre mini kegs of Leffe; a couple of bottles each of Deus Brut des Flandres and De Garre; and some mixed cases including St Bernardus 12, Bush and Gordon’s Finest Gold. Our only dilemma was finding somewhere to put it, but there are worse problems to have! Many months on, most if it’s long gone. It didn’t take long to demolish the supply, save for a few precious Westvelteren 12 bottles which are still waiting in the wings and ageing nicely. But now my tiny kitchen is looking a little bare without all those crates cluttering it up so I think another trip to Belgium, and more specifically Prik n Tik, is in order. If you’re shopping for beer in Belgium I can’t recommend it highly enough.